. . . means doing a lot of nothing, at least this time around. Originally I was planning several days at the beach, but it has been raining for two days. Before you say awhh, you should know we are officially in a ‘drought’ (I admit that I find this to be a slight exaggeration, particularly when you think of what drought means in most parts of the world. Here it means you can only water your lawn once a week). Either way, we do need the rain so we have not been complaining. 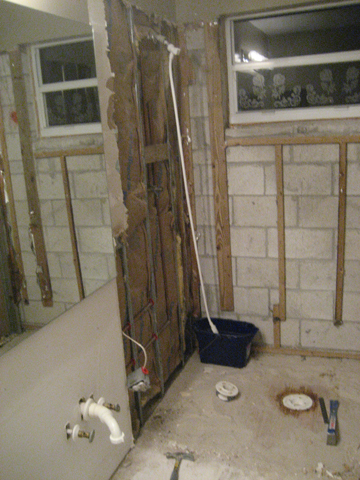 Jon has been tearing our master bathroom out (I guess I shouldn’t say he is doing nothing, but I am). I’ll post a pic below. It isn’t that exciting to see, but I’m so glad it is happening! Tomorrow we are going to visit my parents . . . more of nothing! Its a perfect place to relax, hopefully no rain and I’ll have a few days at the pool. This entry was posted on Tuesday, May 15th, 2007 at 7:45 pm and is filed under Family. You can follow any responses to this entry through the RSS 2.0 feed. You can skip to the end and leave a response. Pinging is currently not allowed.